One of the hardest things to manage when working with clients on transformation efforts is that the people who hire you are often the root cause of why it is so difficult. These types of statements are fairly common in first interviews with potential clients when they are frustrated that they are trying to make change but have not succeeded. I am now very wary of these viewpoints. More often, the truth is just the opposite. When I hear this from a leader, the question I pose is, “What are YOU prepared to do?” This will come as a shock because they think they are change makers. They feel they have been doing all they can to drive change and are up against insurmountable odds. Why will they need to do more? But, in fact, there are several ways that leaders encumber change and, dare I say it, cause it to fail. In a not uncommon example, I was brought into a company where the leader stated from the get-go that she believed their model had about five years of lifespan remaining. The company’s position in the value chain was threatened by cost pressures and disruptive technology, and they needed to explore new territories, structures, and models to survive. The leader specifically wanted a new strategy and new direction. She warned me though, that the people had a static mentality and were unable or unwilling to operate outside their comfort zone. I was going to have to train them and drive them to change. This situation was very exciting to my naïve self. I would have a real chance to make a difference working directly with the CEO, but I now see so many red flags in this conversation. If I had the same conversation today, I would spend many more meetings quizzing the CEO on her strengths and weaknesses, her capabilities as a leader, and her inclinations to be an effective change leader. Over the course of the next few years, I worked with the managers in the company on multiple proposals and approaches to the organization. I found that most of the people in the organization were not only willing to try new things, they had a pretty strong idea of what needed to be done. While there was much trepidation because they had been successful doing the same things for 30+ years, there was also passion for the business and willingness to explore new ideas. The real problem came down to the CEO herself. Her capability to make decisions or embrace those of her leadership, the ability to trust others, and the fortitude to hold the course were all lacking. Given choices, she would consistently call for more analysis pushing choices out months if not years. Faced with the least amount of resistance or a road bump, she would revert to what she felt had been successful in the past. Put into a situation of investing in the business or harvesting through cost reduction and layoffs, she chose the latter. Moreover, she was not willing to be the sponsor of transformation, often pushing that responsibility onto a junior member of the executive team, giving herself the opportunity to separate herself from the results. Challenged by staff, she would often not only fail to support the change, but undermine it. Finally, while there was a preponderance of communication, the focus was often wrong. She concentrated on why it was good for the organization without driving it to what was the benefit for the people. In this particular organization, this was a death knell because the trust between the central organization and the field was a major weakness. Eventually, we were able to get to the point of driving some incremental changes, but we never achieved the level of transformation necessary to secure the organization for the future and, worse, the culture that was left behind was more inclined to resist future change due to this history. The energy it took exhausted everyone involved, spoiled the working environment, and resulted in a huge turnover rate of the team members who favored transformation. Some might read this and question, “But as the transformation manager, wasn’t it your responsibility to coach the leader? Aren’t the leader’s failures yours as well?” To this I would agree wholeheartedly. I learned as much from these types of experiences about leading transformational change as from the experiences that were successful. I believe it has made me a much better advisor in that I have the scars. It is very clear that the difference between success and failure almost always starts with the leadership approach. As a result, I better understand the behaviors of those who are prepared and those who may actually sabotage their own efforts. I no longer mince words or guard them from the truth of their own behavior and I insist on direct access and transparency. So, I thought I would share some of the caveats for leaders – the things I have learned to test for in interviews or in the early stages of a program. Of course, these are not MECE (mutually exclusive and collectively exhaustive) examples. Many are interrelated and some may even be, seemingly, contradictory as they are drawn by multiple examples. A leader’s ability to affect transformation across the organization depends on their ability to affect transformation within themselves. Accepting this will fundamentally shift how one leads. Such introspection is an active process. This is absolutely the top criteria. What has worked in the past may not necessarily work in the future. This is especially true if the organization is experiencing high growth or disruption. The approach to leadership will require a transformation. 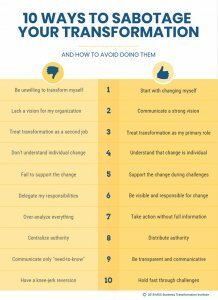 If the leadership is not willing to look within themselves, if they fail to see that they need to change and be the champion of change, they are likely to create barriers to transformation. So many times as an advisor, I have walked into situations where the transformation process is underway but the vision of the future state is unknown or merely a compilation of ideas. To a degree this is OK. We want to leave room for adaptation and experimentation along the way, particularly in complex environments (see Strategic Planning on a Dancing Landscape). But, if the leader is unable to formulate and communicate a vision of the future state, how would they be able to make choices or expect anyone else to be on board and be supportive of the transformation? It is the difference between setting a course to the new world and adjusting to the currents to get you there and just randomly navigating without a destination in mind. Many leaders are not visionaries and often reacting to other influences (competition, new technologies, shareholder demands, etc.) but transformation requires a vision of a better future to build momentum and make decisions. I even advocate that the vision can be one that is intentionally hazy if the future is uncertain, but this needs to be a strategy, not a default position. When I do transformation management workshops, I am often asked, “How can the leader be expected to do all of this AND get their job done?” My response is “What is their other job?” The leader’s role is to move the organization into the future state. If someone feels that doing this is secondary to their “real role,” they need to wake up or abdicate. As a shareholder, employee or partner, I would be concerned if the organization leader is so into the daily operations and firefighting that they don’t feel that driving transformation is their primary and, really, only role. “They will do it because it is their job!” This is a common phrase from a leader with a command and control mentality. It is a lazy comment and shows a complete lack of understanding of why and how people and organizations change. Change happens at the individual level. The leader’s role is to get everyone pointed in the same direction. If they feel this will happen without understanding the “why?” of the situation or how they will benefit from the change, the leader has already created a wall of resistance that will be tough get over. A death knell to any change is when the leader is faced with resistance and is unwilling to support the direction of the change. This is not to say that they should combat resistance on all levels. They need to get feedback and adapt. But ultimately the intention needs to be moving forward and if they cave or undermine the decisions once the course is determined, they might as well end the effort there. Incorporating feedback while keeping the course is an art that is central to leading transformation. Further, if the leader is seen not abiding by their own decisions, walking the walk, then they are undermining the change in a different way. Leaders cannot be above the change they are sponsoring. Prosci, the transformation management training and research organization, states that the #1 success factor for transformation is active and visible sponsorship, but that the majority of the time sponsors are either unaware or unwilling to perform as necessary. I have seen this close up. For whatever reason, leaders want to delegate their responsibility to others. Perhaps they don’t feel the need to be out in front, perhaps they are introverts and find it difficult to interact, or perhaps, more nefariously, they want to distance themselves in case of failure. Whatever the case, many ‘leaders’ are happy to just set the goals (often arbitrarily or unreasonably), and then expect it to happen. From this point, they push and push their teams, who fail to achieve results and then point to them. I have witnessed many a tirade at corporate meetings where the CEO is ranting about their team’s failure to execute without any real involvement on their side. This is different, by the way, than distributing decision making, which is a must. Planning for transformation is necessary. Good planning can accelerate the process if it is the right type – creating the vision, focusing communications and awareness, understanding the transformation and impact to stakeholders, creating ways of developing feedback, and incorporating adaptive and agile approaches, etc. More often though, planning is focused on finding the one answer, the silver bullet, or the right mountain to climb. 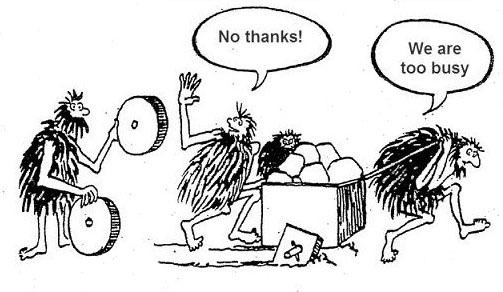 This will happen behind closed doors with a few people looking at charts and data and holding long meetings talking about running more models and analyzing every aspect of the transformation. When this is going on it is an indication that they don’t have a proper vision and are actually looking for reason not to change. Driving transformation across an organization requires all individuals in the organization to be able to affect transformation. Leaders with a strong command and control complex have a difficult time understanding this. They will feel it is the responsibility of the people and stakeholders to bow to their authority. But real transformation requires authority to be distributed. Organizations are not machines where we are simply changing out parts. We are dealing with individuals and their emotions and this means that managers, supervisors, and colleagues need to have the information, connectedness, and authority to help coach each other. Moreover, they will need to deal with an untold number of issues, challenges, and opportunities that the central authority will never be able to anticipate in their plans. Insisting on a centralized approach shows mistrust of the people and an inability to provide the information necessary to make the transformation valid. Leadership creates the framework and provides the tools for change, then enables the people to change (see Change and the Pizza Principle). The biggest red flag in my book is the leader who feels that information is so precious that their people cannot be trusted to learn of it. This is signified by a reluctance to communicate openly whether in group settings or face-to-face. They fear that if the people impacted by the transformation knew about the details, they would create barriers or resist, making life difficult. But what does this tell us? This says that either the leader does not trust their people, or they expect resistance because the transformation is not going to benefit the people impacted. Either way, there is a problem here. Leadership is unwilling to involve the people impacted in a transformation that clearly is important enough for them to react strongly, and they don’t want their people’s feedback. Either the environment of the organization is pretty toxic and/or the transformation is highly flawed (both are big issues). Related to all the above, but hardest to test, is a leader’s willingness to revert to past models and behaviors when faced with challenges. This shows a lack of confidence in themselves and the transformation and points to other issues of character. One way to anticipate this are the issues of delegation of responsibility and failure to support the change discussed above. The leader may be setting up scapegoats, or at the very least, trying to leave the door open. One of my favorite lines from a movie was from Captain Ramius (Sean Connery) in Hunt for the Red October when he said, “When he reached the New World, Cortes burned his ships. As a result his men were well motivated.” While this is a bit harsh (and historically questionable), it shows great confidence in the endeavor. Too many leaders fold at the first sign of trouble, reverting to old behaviors when, in fact, the rest of the organization believed in the course. Fortitude and courage go right along with empathy and flexibility in my humble opinion. …then you are likely already behind the eight ball and have some work to do.